The BigShot EFX is a true-bypass effects loop switcher that lets you set up two separate effects loops and insert them into your pedal chain at will. This means that noisy pedals or tone robbing non true-bypass pedals that you ‘love to hate’ can now be used and completely taken out of the signal path when they are not needed. Better yet, while an effects loop is on ‘standby’, you can turn on and off pedals at will and prepare your sound. Then, with one foot stomp you can turn on as many pedals as you like for professional multi-effects performance without the usual tap dancing! 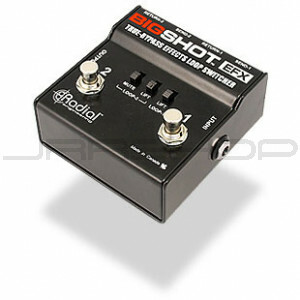 Add the BigShot PB1 buffer into the loop and you can now drive as many pedals as you like without adding noise. For those that like quiet tuning, you can use the second loop as a tuner out and the BigShot EFX will mute your signal with a single stomp. Compact, rugged and plug & play easy to use, the BigShot EFX opens the door to professional pedal management and lets you do it all right at your feet!